But what if I don't wanna be Queen? It's no fun. If there's so much I must be. Can I still just be me. [to Ash] Shouldn't you know? (Worried) Gayrados you've got to calm down! 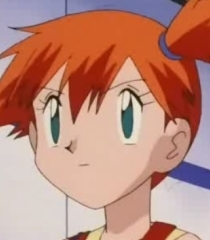 (Cheerful) I'm Misty, nice to meet'cha!